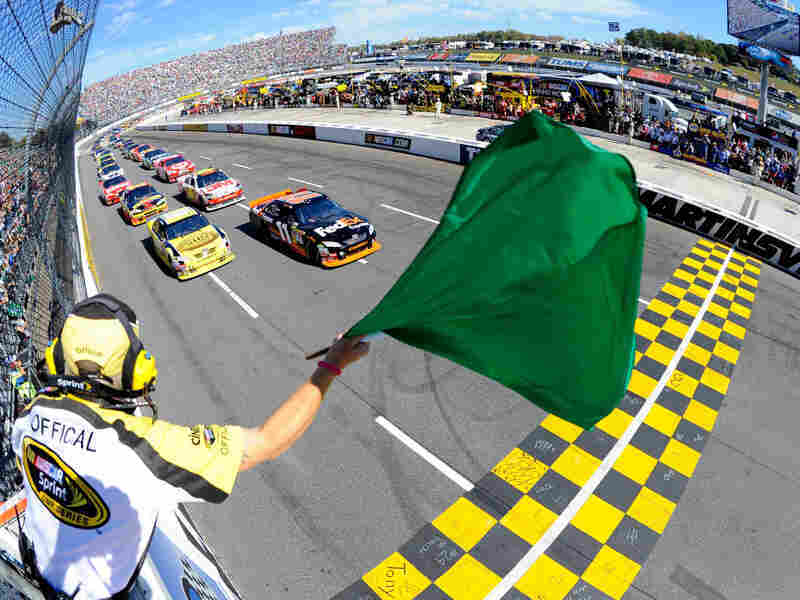 NASCAR Gives Ethanol Green Flag; Who Will Follow? With all-American NASCAR now touting its use of ethanol blends in its race cars, the ethanol industry is taking the marketing pitch into overdrive in hopes of winning broad acceptance. The problem is, it's hard to figure out exactly what you're buying. New problems arise for the meat industry — along with a debate over whether ethanol is worth it. When it announced that it would use ethanol in its racing fuel, NASCAR joined a wider trend in the United States. When it comes to ethanol, price, fuel economy and engine performance matter to lots of American drivers. The ethanol industry fights hard to shape public opinion of the fuel, and it has now found a new way to get its message across in a partnership with NASCAR. Our series on ethanol concludes with a report from Harvest Public Media's Jessica Naudziunas on the ethanol industry's attempt to answer longtime critics of the alternative fuel. In NASCAR, a pit stop takes just seconds. This February, starting at the Daytona 500, the sound of the stop will be a little different. "And here comes Jeff Gordon. Nice clean stop in his pit box. The first of two cans of the all-new Sunoco Green E15 going in." That's right -- Sunoco Green E15. Starting next season, NASCAR will use a 15 percent ethanol-gas blend. It has a bit more ethanol than E10, which many gas stations today offer as regular fuel. This year, trade group Growth Energy signed a six-year deal with NASCAR to promote the new product. So, if Jeff Gordon wins the Sprint Series on Sunoco Green E15, ethanol must be liquid gold, right? It really depends whom you ask. If Growth Energy CEO Tom Buis has your ear, you might think ethanol is good for you. "They wouldn't be going backwards in choosing their fuel -- none of these racing series would," Buis says. "And so it's a tremendous opportunity to demonstrate to consumers what a great fuel it is." Charles Drevna, president of the National Petrochemical and Refiners Association, disagrees. "I think it is a complete bastardization of comparison to say, 'Well, NASCAR can use it, then the average driver can use it' -- no more than you can say, 'Look, if it is good enough for NASA to put rocket fuel in Challenger, then we can put it in automobiles, too," Drevna says. "Completely different applications. Comp­letely different fuels." Drevna is part of a coalition fighting the EPA's recent approval of 15 percent ethanol in some cars. For years, ethanol has been used as a fuel additive to boost octane. But at higher blends, Drevna says, ethanol makes engines knock. And, he says, "a gallon of gasoline will take your vehicle a lot farther along down the road than a gallon of ethanol will." As the ethanol and oil industries squabble, the word on the street is just as divided. Not everyone lines up happily to buy ethanol. Online, many comments reveal that people are concerned about the cost, effectiveness and efficiency of ethanol in their gasoline. Buis of Growth Energy rejects the angry chorus of what he calls "misinformation." "The differences between E10 and E15 would be minimal at best, if nonexistent -- or probably more likely nonexistent, in terms of miles per gallon," Buis says. But whom should we believe? To get that answer, we sought an extreme example. To test ethanol fuel efficiency, Dan Edmunds -- director of vehicle testing for auto-research site Edmunds.com -- twice drove from San Diego to Las Vegas and back in a flex-fuel car. First, he fueled up with standard E10 gasoline. "On gasoline, we made the round trip with 36.5 gallons of gasoline," Edmunds says. He then repeated the trip using E85, with 85 percent ethanol. The fuel is available in small pockets throughout the country. "And on E85, it took 50 gallons -- 37 percent more fuel to make the round trip," Edmunds says. "Same distance, same vehicle." So, as ethanol replaces gasoline, you'll likely need to make more stops at the gas station. Still, the ethanol industry says it has done its own research, which says otherwise. It's likely that this fuel fight will really rev up in 2011, when the Department of Energy could approve E15 -- similar to NASCAR's new fuel -- for use in more cars. And to be able to meet the government's renewable fuel mandate by the year 2022, the ethanol industry says, all American fuel will need to contain more ethanol. Their sweet spot is closer to E27.